In a general sense David credits God with man’s creation. But more specifically David declares that God was personally involved in David’s creation. This would seem to present us with a contradiction which begs to be resolved. The Bible believing individual rightly extrapolates from their study of the Bible that God specifically and by His own hand created both Adam and Eve. Both scientifically and historically we rightly conclude that every individual human being after Adam and Eve is the product of procreation, rather than creation. 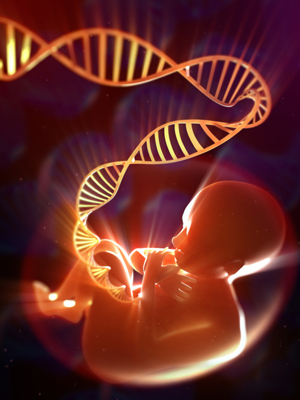 We can further make consistent scientific observations and demonstrate with overwhelming empirical evidence that every human being currently in existence is a product of procreation. How does this affect our understanding of what David wrote in Psalm 139? Because human procreation is wholly dependant on the physical attributes of the parents, and God created the original two parents through whom all people are derived (procreated), we can rightly ascertain that God indeed included the procreative model in man’s physical design. This means that God gets the credit for both creation and procreation. God is worthy of worship! This still does not explain David’s claim that God did the forming of his unborn person. In this passage we accurate deduce that David proclaims God is not only aware of the procreative process, but He actively participates in the forming of each baby in the womb. David was talking specifically about himself and not every baby, but it would be an unreasonable conclusion that David was the only one God was involved in forming. God did not leave all others, besides David, to the procreative process as if it were some auto piloted scientific process. To me this passage underscores, bolds, and highlights the truth that God deeply loves all of mankind. You could say there are three levels of depth of God’s love for us. Firstly, Yahweh demonstrates His love for man in the initial creation of our parents Adam and Eve. Secondly, our God demonstrates His love for each individual by attending and overseeing their formation in the womb. Thirdly, our creator Yahweh demonstrates His love for us by Himself being born as a man and dying for our sins in order to reconcile us back into fellowship. Because verse fourteen is true of David and every other individual ever born or yet to be born, we are priceless! We should never do harm to one other. Why? For two reasons. As Genesis 1:27 so clearly states God created man in His own image! Why would we do harm to something that reflects God? Think about it. We treat the Mona Lisa as a priceless work of art on display for all to see. At great expense the painting is secured with state of the art security equipment. Special lighting is used in order to not cause damage. Many have marveled over the similitude of a woman painted. And yet the object of their admiration is simply paint applied to canvas by an artist. Do we then value this inanimate two dimensional image of a woman more highly than an actual man or woman? A living, breathing man or woman possess a soul and is alive because a loving creator created them in His image. Created in God’s image and purchase by the death of God’s only Son! You and I truly have been “fearfully and wonderfully made” by a loving Father. How different our world might be if everyone believed this truth. Would we have murder, abortion, euthanasia, physical abuse and war if we truly valued God’s creation (man) and praised Him for it as the Psalmist David did? Psalm 139 is beautiful poetry and a powerful truth giving us all just one more reason to worship Yahweh. 1 Reply to "Psalm 139:13-16"
No. We would not have war, abortion, euthanasia, and murder if mankind loved God’s creation that He made in His image as they should. In fact man loves other things more than Gods created image of Himself typically. Very 😞 sad!